Metrics that Matter: Does a pass-catcher's drop rate matter? For whatever reason, these words haunted me. Every time I drew a target from that moment on, I’d see the ball, put my hands on it, and drop it. The next few weeks of practice, I dropped nearly every target that came my way. I was shook – anxiety, “the yips,” getting stuck in my own head – whatever you want to call it, I had a problem. I quit several weeks later and never really forgave myself for not sticking with it, but at least my fantasy football career was more prosperous. 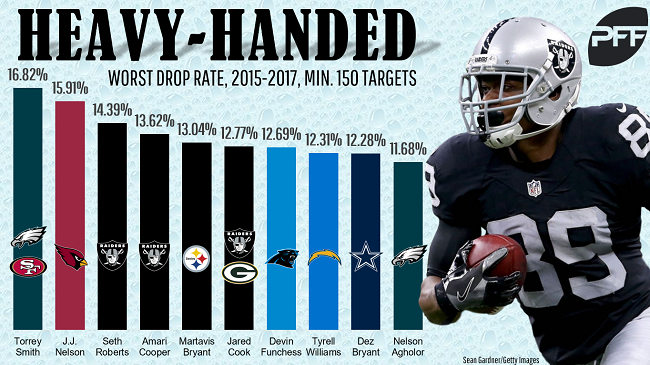 In order to make myself feel better about my athletic shortcomings, I was curious to see which NFL receivers had the worst hands (or, largest drop rate) over the last three seasons. Drop rate is the percentage of catchable targets dropped by a receiver, and you can access that data yourself in our Signature Stats suite if you’re an Elite subscriber. It’s interesting to note Torrey Smith at the top of the list. He has a similar skillset (speedy, deep-ball specialist) to Ted Ginn, who ranked sixth-worst in drop rate during his last two seasons in Carolina. Devin Funchess ranked worst over this stretch and seventh-worst over the past three seasons. Perhaps Carolina doesn’t think drops are a “metric that matters” very much for receivers. Amari Cooper stands out as well, and that should come as no surprise. Cooper led the league in drops (18) and drop rate (20.0 percent) in his rookie season (2015), but then seemed to get past the issue in 2016, dropping only four passes. In 2017, Cooper again led the league in drop rate (17.2 percent). Not only are these numbers bad, but they’re historically bad. Since 2007, there have only been three players to see at least 100 targets and post a drop rate of 17 percent or worse: Braylon Edwards (2007 and 2008), Greg Little (2011), and Cooper (2015 and 2017). 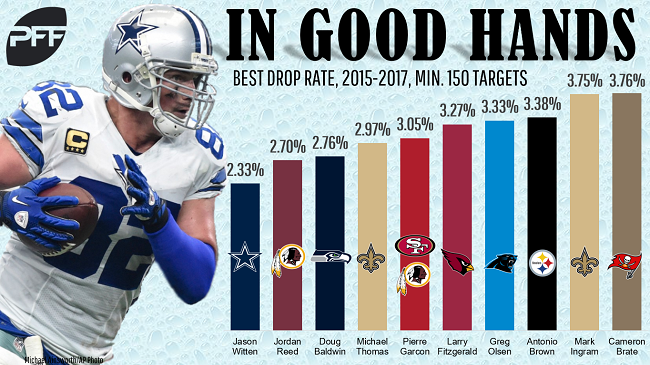 Dez Bryant had a league-leading 12 drops last season, but I’m not as concerned with him, considering he dropped only 13 passes over the three seasons previous. Interestingly, with this list we have a number of receivers who are commonly referred to as some of the best in the league. Larry Fitzgerald has long had a reputation as having the surest hands in the NFL, and the data here clearly holds. Cooper has dropped 33 passes in his short three-year career. Fitzgerald, for perspective, has only 34 drops over his past 10 seasons. He averages 147.4 targets per season since 2006 but has never dropped more than five passes in any season over this stretch. Throughout his career, Cooper averages one drop every 10.6 targets. Fitzgerald (since 2006) averages one drop every 42.1 targets. Since 2007, Jason Witten has hit a new career-low in yards per route run in 10 of these 11 seasons, bottoming out at 1.17 last season, while his previous career-low was 1.40. Although he’s clearly near the twilight of his career, he at least offers reliable hands, leading in drop rate over the past three seasons. What does this mean for fantasy? Last season I did a study examining drop rate and found an extremely low correlation to year-over-year targets and fantasy points scored. Of the stats I examined, drop rate was also the least predictive year-over-year. This means drops are, for the most part, fairly random. In its relation to targets in the following season, it also appears that drops aren’t something NFL teams or quarterbacks are fairly bothered by. I imagine, because of Cooper’s route-running prowess, Derek Carr is willing to live with the occasional drop. Do drops matter for fantasy? I’d say not really. At the extreme, I’m sure they matter, but definitely not as much as other skillsets like route running, contested catch ability, or yards created after the catch. They matter for fantasy in that drops mean a loss of fantasy points. Using our Actual Opportunity data, we can see how many points Cooper lost had he not dropped a single pass all year. Of Cooper’s 10 drops, two came from the 2-yard line, four came inside the 20, and one was a 48-yard bomb that would have placed him within five yards of the end zone. In total, this was worth 20.9 expected fantasy points (how many fantasy points a perfectly average receiver would have scored on these targets). For perspective, this was the difference between him finishing 25th in fantasy points at the position and 35th. So while drops matter in that if Cooper had fixed these issues he would have scored more points, I don’t think drops are something that should factor into our rankings and projections. Cooper will still draw a high number of targets (new head coach Jon Gruden recently said so himself) and he’ll continue to be one of the top scorers at the position – you’ll just have to live with some frustrating drops. If rostering him next season, I think you’ll be happy, but I’d suggest not placing any projectile objects within your vicinity when watching his games.